How Does a Parasail Work? 1 You've seen them at the beach - big yellow smiley faces or neon-colored rainbows floating in the sky. On a closer look, you notice that these colorful parachutes are being towed by a speedboat. You also notice one or more people harnessed below the chute taking a ride. 2 These fun-to-ride parachutes often seen at the beach are called parasails, a special type of amusement ride found only in windy areas like the seashore. While they may look like thrilling, rollercoaster-type rides or even like some type of extreme sport, people who have tried them say that the ride is smooth and peaceful. Companies that advertise parasail rides say that you don't even have to get wet. No experience is necessary, and anyone from about six years old on up may ride. 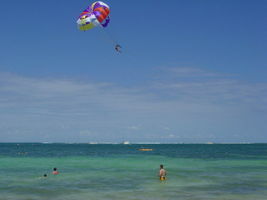 3 The parachutes used for parasailing are large ones, as wide as thirty to forty feet. They are attached to strong cables which are attached to a winch. The winch is something like a large fishing reel that is used to wind up the cable. 4 Below the parasail itself are harnesses for the flyers. Some people fly individually. Others fly in groups of two or three. In this case, a strong aluminum bar connects the individual harnesses side by side. The flyers wear life jackets for their safety. 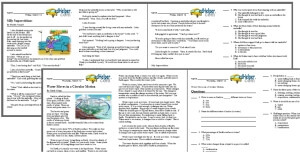 Feedback on How Does a Parasail Work?